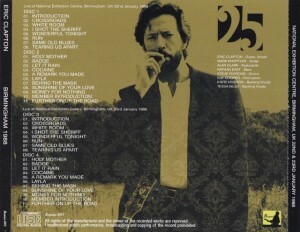 Live At National Exhibition Centre, Birmingham, uk 22nd January 1988. 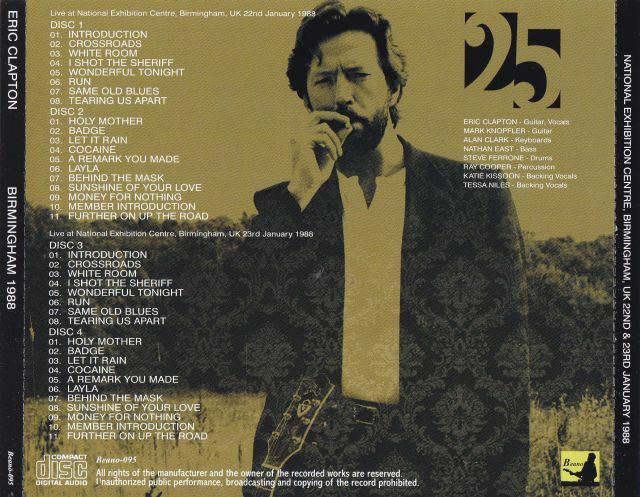 1988, this board is the one you complete recording in superb stereo audience recording of the surprise the two-day performance England, in Birmingham became the first traveled to Celebrate tour Eric Clapton is to commemorate the 25th anniversary of his professional debut . According to this person taper, it is that at that time, and was recorded for two days both are loaded with metal cassette in professional cassette recorder made ​​by Sony. By on both days, and was recorded in the same seat VIP parties sit down, there is a unity of stunning sound as a set of 2 days. For the first day, titled “Congratulations!” Had been released previously, the master of this board is full by different masters also sound image at all with its outstanding panel was intense hiss. The master of this board, and as it was realized the best clean sound clear to the highest no bill for complaint, this time, by a network of its own, our Because I produce it to get the master of the first generation from the taper himself , I can affirm to be the sound quality of this ultimate.In addition, the title of the audience recording had been released from the label of another former second day performance, but the sound quality of this place was inferior considerably compared to its outstanding panel of the first day. Therefore master this time, our store have obtained is a thing that can be asserted because it is the highest quality grade of the same first day, this place and realized the sound quality of the ultimate day. The 25th Anniversary Celebrate World Tour that began from here, leader of Dire Straits, Mark Knopfler has already joined. 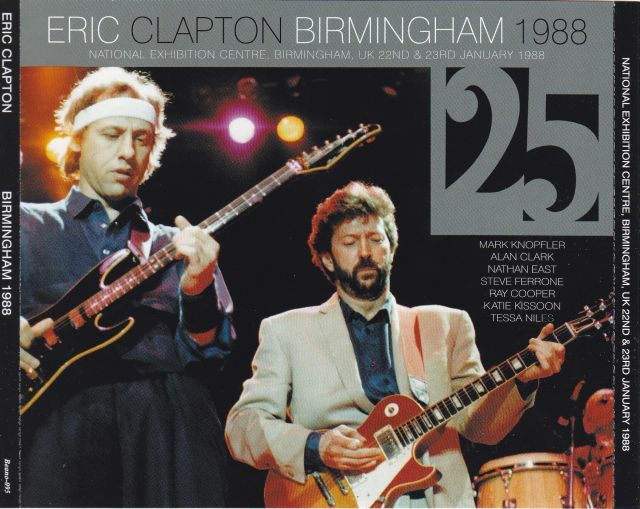 This time, Knopfler and Clapton is attracted to play each other, it had become the relationship that you respect each other. 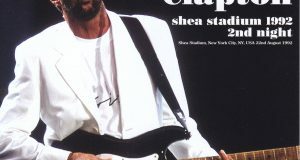 Whole book has been decorated with painful obbligato by finger picking of Knopfler unique, representative music of Clapton has increased the shine further. 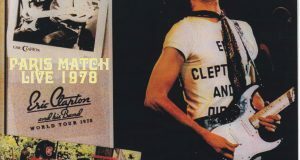 Reward his achievements, Clapton has been doing featuring his hit song Money For Nothing maximum of Knopfler. It came to Japan in the fall of this tour, but you can listen to here the number Run that was out of the set list, Same Old Blues, and Holy Mother at that time. In addition, that motivated yellowtail of Clapton of the start time can realize, the encore that usually ends with a Sunshine Of Your Love, I have demonstrated the spirit of service to do the number of Knopfler further, that do to Further On Up The Road. Physical strength and willpower will had been enhanced very much. 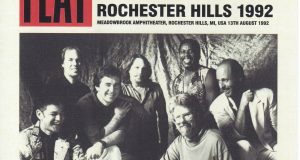 In Further On Up The Road this, once solo is performed on all members further, bass solo of Nathan East, until the drum solo of Steve Feron has built unusual. Part to rush into medley to Sunshine Of Your Love also excited from Behind The Mask. It is a stage of both days without only be called the most wonderful. Click or would believe it was the second day and this is the first day of the tour. I think I would like Watch with highest sound quality of this board by all means this wonderful performance of energy fully open. It becomes limited release in the press board, because there is a limited number, please order your interest as soon as possible. ★ subsequent blockbuster of last week in the “ST AUSTELL 1983”, is the title of the ultimate recording by the same person! ! Also this board, it is a great masterpiece of items no doubt acclaimed Clapton and title of the best this year. It is really amazing. ★ I am using the original photo’s recording took in itself than VIP seat of stakeholders dedicated to jacket.